Ding Ding Ding........ The the FUN begins!!!! 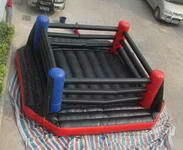 With this enormous Inflatable Boxing Ring. Each "Super Boxer" has his/her own set of Super Padded Boxing Gloves that are LARGER THEN LIFE! A sure crowd pleaser!!!!!! !